The steel post that can be made to look like wood. 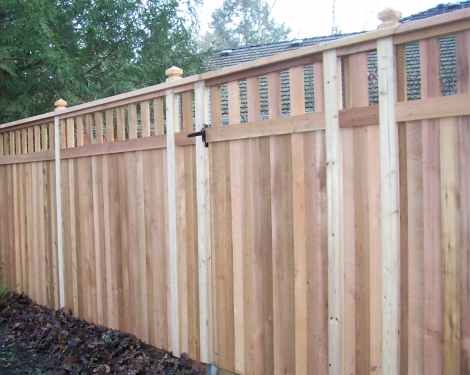 A wood privacy fence will last only as long as the posts do. Wood posts, both cedar and treated, will eventually rot out and decay. Steel posts will last a lifetime. Steel posts will cost more than wood posts initially. 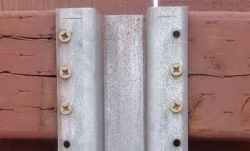 Over time as wood posts decay and need to be replaced the cost difference between wood and steel posts becomes minimal. "Very satisfied customer! Put my fence up in Louisiana 2 years ago and it's still looking great!" The VersaPost is the steel fence post for wood privacy fences that is easy to conceal. The fence rails are attached directly to the sides of the posts through the open C-channel. It functions as a line, end, corner or gate post without any special clips or brackets. 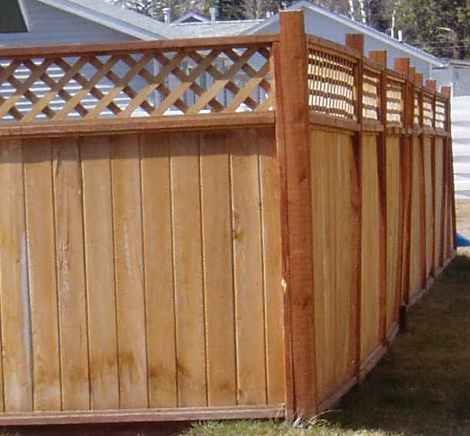 With the VersaPost you can build a beautiful wood privacy fence that will last for years. No other fence post is as versatile. No other steel post is as easy to hide. See just how easy it is to install the VersaPost. The choice of posts is one of the most important decisions made when selecting materials for a wood privacy fence. Be sure to compare the quality, price and longevity of the posts. Keep in mind that the costs of the posts is actually only a small portion of the total cost of the fence. When the price of concrete and gravel are included a steel post can actually cost less than a wood post. Use our calculator to find out just how much a steel post will cost compared to a wood post. Compare the VersaPost with other fence posts for wood privacy fences. A wood post is usually the most economical choice initially. Wood posts are usually cedar or pressure treated pine. Most commonly they are 4 x 4 or 6 x 6 inches in size. When using a wood post the hole is usually larger than when using a steel post. Gravel should be placed below the concrete to improve water drainage. Cedar is a naturally rot-resistant species of wood. A cedar post can make for a beautiful wooden fence. But even cedar posts will decay when in contact with warm, moist earth. And cedar posts are not inexpensive either. In fact, in many cases a cedar post will cost as much, or more, than a steel post. Treated wood posts are most often pine treated with chemicals to resist decay. This type of post is usually the most economical choice initially. The chemicals used are most often copper based because copper has anti-microbial properties. The most commonly used chemicals for treating fence posts are complex compounds that go by acronyms such as CCA, ACQ, CA or Copper-Nap. Some of these chemical treatments contain elements which are known to be toxic to living things. There is some concern that these chemicals can leach into the soil and water. This fence is only a few years old. Look carefully and you will notice that the posts are already starting to fall over. For a longer lasting fence a steel post should be used rather than wood. 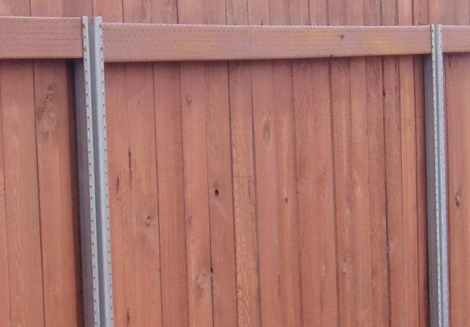 Round steel posts have been the standard metal post for wooden privacy fences for many years. 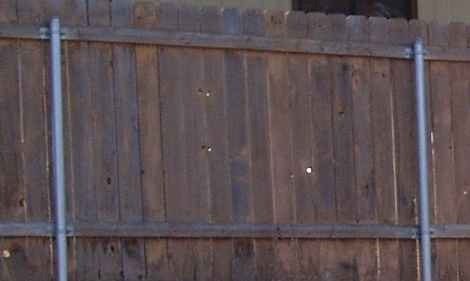 The round steel posts used for wood privacy fences are usually 2 3/8" in diameter. 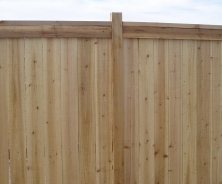 Because a privacy fence must withstand wind pressure these posts have thicker walls than typical chain link fence posts. They commonly are known as 20 weight and will have a wall thickness of about 0.865". Steel will oxidise, or rust, in the presence of oxygen. Moisture can accelerate this process. Therefore steel must be treated to resist this oxidation. The treatment of choice is to place a coating of zinc on top of the steel. This process is known as galvanization. The zinc layer "sacrifices" itself and protects the steel from corroding. The more zinc that is applied the more resistant the post will be to corrosion. Because round posts are hollow they need to be capped to prevent water from entering, and remaining, inside the post. It is difficult to attach a wooden stringer directly to a round metal post. Special brackets are attached to the post and the wooden stringers are then attached to the brackets. These brackets can be expensive and they are always labor intensive to install. When you are finished you will have a fence that will last for years. You will also have some ugly looking steel posts (like the ones above) that either you, or your neighbor, will have to look at for years to come. Instead of the ugly round steel post consider a steel post that can be covered to look like wood. Hat-channel posts were developed to eliminate some of the drawbacks associated with round steel posts. The design is that of a U-shaped channel with flanges extending out on either side. The cross-sectional view resembles a top-hat thus the name "hat-channel". The hat-channel is an improvement over both the wood post and the round steel post. It has the strength of steel but does not require any brackets or cap. It can also be hidden from view by a cover board which results in a cleaner looking fence. The hat-channel post does however suffer from some serious deficiencies. By its very design the hat-channel shape has a tendency to twist when subjected to a lateral force such as wind. The flanges on the post are only about one inch wide. This provides very little contact area for the fasteners that are used to attach the stringers. Over time the ends of the stringers can split where the screws are inserted. The flanges themselves are about 1/8" thick. Add the screw heads and there is enough material to cause the cover board to crack if it is not installed very carefully. And, because the total width of the post is over four inches, there is very little room for the screws that are used to attach the cover board. When installing hat-channel posts you need to take care not to install some of them backwards. This has happened to more than one professional fence crew. Special clips are required to use them for corner posts. End posts pose another difficulty because of the exposed flange on one side of the post. Gate posts require two posts that are fastened together. This results in a higher cost for both materials and labor. Lastly, the only hat-channel posts currently on the market are imported from communist China. As much as possible we believe that we should support American workers. The VersaPost is made in America by American workers. The steel post that can look like wood. The VersaPost eliminates the problems associated with wood posts, round steel posts and hat-channel posts. The VersaPost does not require any clips, brackets or caps. It functions as a line, end, corner and gate post without any modifications. With the VersaPost the stringers are attached directly to the side of the post. There are no flanges that will interfere with a cover board. The VersaPost can easily be made to look like a wood post or even a black iron steel post. Because the screws go across the grain at an angle there is a very strong bond with no tendency for the stringers to split over time.